REGIONAL LEAGUE ROUND-UP: Stockport County are the new North West League leaders, while Torquay United have taken over at the top of the South West. PREMIER – Cambridge City’s Isabella Simmons got the only goal to take the points at Brentwood Town to stay top. Billericay Town remain a point behind after defeating Acle United 4-2, Paris Smith with two of their goals. Writtle went third after edging a seven-goal thriller at AFC Sudbury. Bedford are within a point of AFC Dunstable in mid-table after they beat them 2-0, Setor Acolatse and Eden Kibron scoring. 1 NORTH – Kings Lynn Town moved seven points clear with a 5-1 result over Silver End United, Olivia Baker bagging a brace. 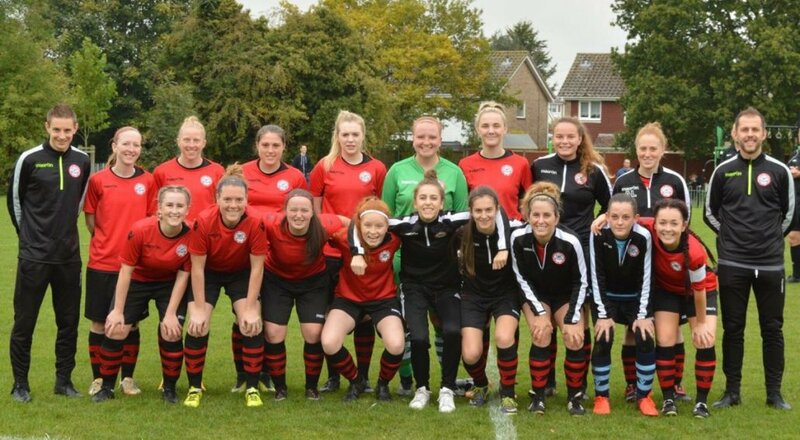 Second-placed Ipswich Wanderers were walloped 8-0 at home by Wymondham Town – who have seven games in hand on them – and Hannah Waters featured with a five-goal haul. Ipswich Town Development scored three times in the last 15 minutes to hold Histon 4-4, Grace Bowman netting two penalties and Emily Steward also scoring twice. 1 SOUTH – Little Thurrock Dynamos made it seven wins on the spin, Kerri Thomas twice on target in a 3-1 result at Hutton. Bishops Stortford won the basement battle with Hertford Town by four goals to two. 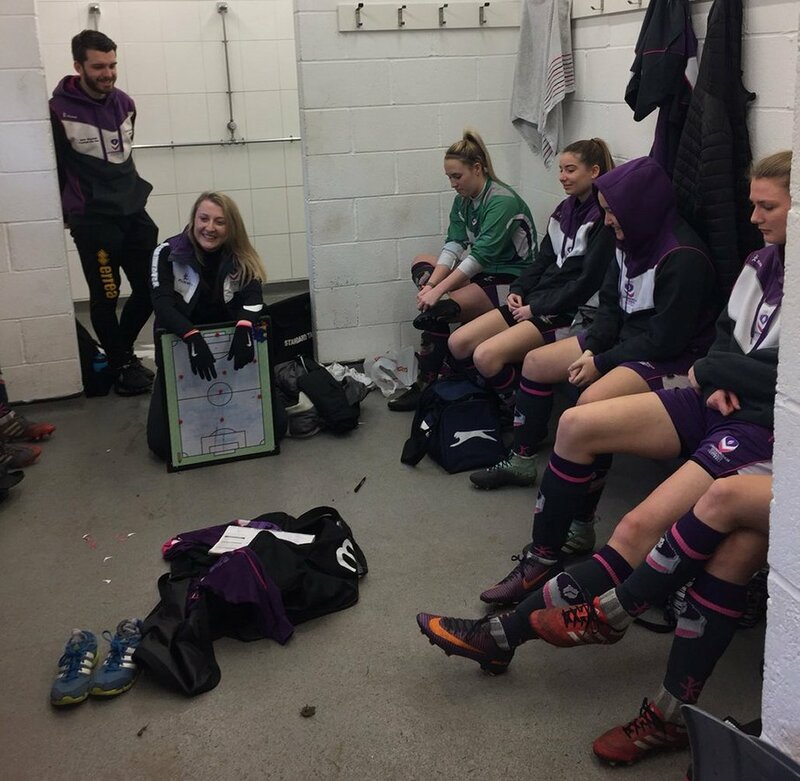 PREMIER – Oughtibridge War Memorial missed the chance to go top, when held 1-1 at home by Loughborough Students. Peterborough Northern Star gained ground with a 2-0 win at Arnold Town. Mansfield Town’s Emma Day scored the game’s only goal at Ollerton Town. A Laura Beckett brace saw Kettering Town draw 2-2 with Eastwood and Mansfield Hosiery Mills managed a second win of the season, 2-0 over Rise Park. 1 SOUTH – Third-placed Corby Town sank Desford 7-1, with two apiece for Nicole Andrejczuk, Hannah Marshall and Stacey McConville. Keir Perkins was on target three times in Peterboro United’s 4-1 score with AFC Leicester, while Thrapston Town turned over Loughboro Foxes Vixens 4-2. 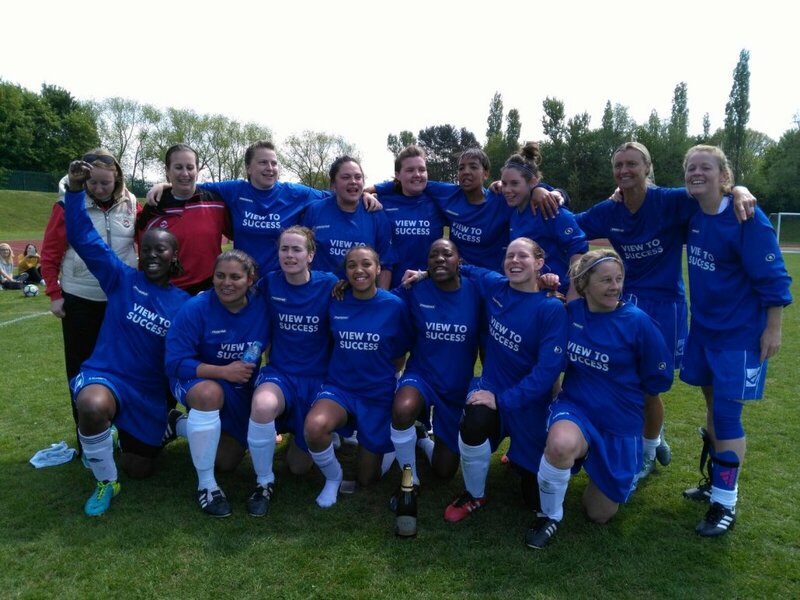 Surrey-based Victoire pictured enjoying previous success, lost 6-5 to QPR Development. PREMIER – London Kent Football United are just two points behind Carshalton Athletic after winning 2-1 away to them. LEAGUE CUP GROUP B – AFC Phoenix edged Parkwood Rangers 2-1 with goals by Saskia Philp and Brittany Saylor, while Aylesford drew a blank with Eastbourne Town and Fulham were awarded a home win over Watford Development. GREATER LONDON PREMIER – Bottom of the table Victoire pushed leaders QPR Development absolutely all the way in an incredible eleven-goal thriller, that Rangers won 6-5 thanks partly to a Chloe Sampson treble. Second-placed Whyteleafe’s first-half goal was enough to see off Spurs Development, who had Elisha Soula dismissed. Hackney hit third spot with a 2-1 win over Regents Park Rangers. Colne Valley claimed their second win of the season, 3-2 against Hemel Hempstead Town. AFC Wimbledon Development got all the three goals in the first period against Hampstead, Nyara Denny with two of them. SOUTH EAST COUNTIES LEAGUE CUP 2ND ROUND – Bexhill United overcame the sending-off of Gabriella Beckett to beat Ashford 2-1 after extra-time. Dominique Beckett and Laura Swarbrooke their scorers. Following a 1-1 tie, Milford & Witley went through 4-3 on penalties at Eastbourne LFC. Chichester City DS came from behind to win in the extra 30 minutes at Herne Bay, where Kally Ambler bagged a brace. Meridian got the better of hosts Kent Football United by the odd goal in seven, of which Zoe Counter got a crucial couple. Billie Phillpot netted all three for Hassocks in a 3-1 win at Phoenix Sports, Crawley Wasps Reserves were 3-2 winners at Maidstone United, while Cowfold bowed out 2-1 at home to Worthing Ladies. PREMIER – In the only match played, Hartlepool United hit double figures against Wakefield to rise to third in the table, Caitlin Bates top-scoring with three in the 10-0 scoreline. 1 SOUTH – Harrogate Railway scraped a 5-4 win at basement side Swallownest Beighton to go top, Emma Lansdal netting a hat-trick and Nicola Hadley their other two. Ossett Albion leapfrogged Sheffield Wednesday into fourth spot, after defeating them 4-1 away. PREMIER – Stockport County are new leaders after running in eight goals at Accrington Ladies. Fleetwood Town Wrens are second on goal-difference after beating Blackpool in the local derby. Wigan Athletic went fourth when putting four goals past CMB and Manchester Stingers beat Blackburn CSC 3-1. 1 NORTH – Cammell Laird are six points short of leaders Penrith with two games in hand after a 2-1 win against Workington Reds. Bury are a point further back having hit Bolton Wanderers U-21 Reserves 5-0. There was a secons victory for Carlisle United, 5-3 over Morecambe Reserves, likewise for Kendal Town, 2-0 versus Leigh RMI. 1 SOUTH – FC United maintained their big lead with a 3-0 result over Liverpool Feds Reserves. Warrington Wolverines 3-1 win over Crewe Alexandra Development kept them second and Curzon Ashton are still third, having thumped City of Liverpool 8-0. 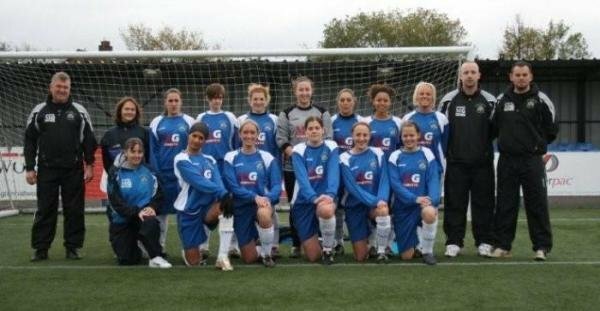 Stockport County Blues rose to sixth by hammering Northwich Vixens 11-0. PREMIER – Seven straight wins now for leaders Chesham United, netting five times at Milton Keynes City. Ascot United’s 3-1 victory over New Milton Town put them into second position. CHAIRMAN’S CUP 1ST ROUND – Among Oxford City’s nine goals at Newbury were hat-tricks by Mollie Dyer and Lauren May. Winchester City Flyers won 4-0 at Alton, Francesca Thornton scoring twice. Wycombe Wanderers had a walkover against Shanklin, as did Southampton WFC Reserves at Benson Lionesses. JUBILEE CUP GROUP A – AFC Bournemouth’s Chloe Tape found the net four times in a 7-2 win at Wokingham & Emmbrook. GROUP B – Millie Bilcliff’s three goals for Wargrave was all in vain, as Megan Fox hit five and Warsash Wasps walked away 8-5 victors. PREMIER – Torquay United ran out 9-0 winners at AEK Boco and went top as a result. Stephanie Beck, Sian Chapman, Daisy Self and Emma Mingo all scored twice. Bishops Lydeard are fourth after a 3-1 defeat of basement side Downend Flyers. 1 EASTERN – Almondsbury are second on goal-difference with a 4-1 win at FC Chippenham. Oldland Abbotonians sealed a first win with a Lidiya Mykhalechko brace in a 4-0 scoreline at Frome Town. Portishead’s match with St Nicholas Reserves was abandoned. 1 WESTERN – Plymouth Argyle Reserves remain in pole position with an 8-1 win at Exeter & Tedburn Rangers, who contributed three own-goals. Callington Town’s Lucy Bounsall led the way with four goals for the second-placed side in the 9-1 thrashing of Activate. Alphington leapfrogged Bude Town into third spot, beating them 4-2 away with the help of a Laura Burwood treble. Plympton fought back from 2-1 down at the break to win 4-2 at Bideford, with Samantha Metters hitting a hat-trick. PREMIER – Leaders Leafield Athletic dropped points for only the second time, held 2-2 at home by Stockingford AA Pavilion, who had trailed 2-0. Bedworth United replaced Crusaders in second after sending them to a 4-1 defeat. Kingshurst Sporting Club are fifth after winning 7-0 at Worcester United, Lye Town lashed Leamington Lions 9-0 with four from Rhiannon Bate and Knowle netted the only goal at Wolverhampton Sporting to go within a point of them. 1 NORTH – Goldenhill Wanderers are three points behind top team Sutton Coldfield Town, after a 4-2 result at Tamworth became their eighth win in a row. Third in the table Wyrley ran out 7-0 winners at Shrewsbury Juniors. Atherstone Rangers are on Brereton Town’s heals having won 2-1 away to them. 1 SOUTH – Gornal’s narrow 3-2 victory over Solihull United sees them still in first place, while Redditch United record an eighth straight win with five goal against Rugby Town. Kidderminster Harriers won 5-0 over Solihull Sporting, Coventry Sphinx won the derby with Coventry Development 4-0, while Stourbridge hit Droitwich Spa 6-2 away to go level on points with them.